Did Malaysian plane fly toward Indian Ocean after last contact? KUALA LUMPUR, Malaysia -- Malaysian authorities expanded their search for the missing jetliner westward toward India on Thursday, saying it may have flown for several hours after its last contact with the ground. CBS News correspondent Bob Orr reports that there are technical indicators suggesting the plane continued to fly for an unspecified period of time after civilian air traffic controllers lost radar contact with the jet. Sources say the Boeing 777 continued to attempt to transmit routine data about the plane's engines and performance to satellites. Malaysian authorities and Boeing apparently did not downlink the data, so details from plane's transmissions are not known. All of this, Orr reports, is leading to the possibility that the jet flew for hours toward the Indian Ocean. And it is the reason the search field is expanding in that direction. That scenario would make finding the Boeing 777 a vastly more difficult task, and raises the possibility that searchers have been looking in the wrong place for the plane and its 239 passengers and crew since it disappeared early Saturday en route to Beijing. Meanwhile, the White House, citing "new information," confirmed that the search for the plane might be extended to the Indian Ocean. India says its navy, air force and coast guard are now looking for the missing plane after it received a formal request for help from the Malaysian government. In the latest in a series of false leads in the hunt, search planes were sent Thursday to search an area off the southern tip of Vietnam where Chinese satellite images published on a Chinese government website reportedly showed three suspected floating objects. "There is nothing. We went there, there is nothing," said acting Malaysian Transport Minister Hishammuddin Hussein. Compounding the frustration, he later said the Chinese Embassy had notified the government that the images were released by mistake and did not show any debris from Malaysia Airlines Flight 370. The plane left Kuala Lumpur and was flying northeast across the Gulf of Thailand and into the South China Sea when it dropped off civilian radar without any indication it was having any technical problems. An international search effort is methodically sweeping parts of the South China Sea. A roughly similar-sized hunt is also being conducted to the west in the Strait of Malacca because of military radar sightings that might indicate the plane headed that way after its last contact, passing over the Malay Peninsula. The total area is around 35,800 square miles, or about the size of Portugal. Sources close to the investigation tells CBS News that the NTSB has validated the Malaysian military radar records and has determined that it is necessary to expand the search to the western Strait of Malacca. CBS News national security correspondent David Martin reports that the U.S. military is shifting the USS Kidd from east to west of the Malaysian peninsula and the USS Pinckney is going back into Singapore for repairs. A Navy P-8, the newest version of the P-3 maritime surveillance plane that has been there, will replace the P-3 Friday. Sullenberger: WSJ report denied by Malaysia officials "opens up whole host of new questions"
The Wall Street Journal newspaper quoted U.S. investigators on Thursday as saying they suspected the plane remained in the air for about four hours after its last confirmed contact, citing data from the plane's engines that are automatically transmitted to the ground as part of a routine maintenance program. "This opens up a whole host of new questions," CBS News aviation and safety expert Captain Chesley "Sully" Sullenberger said on "CBS This Morning." "There's still much we don't know," said Sullenberger, explaining that only Boeing, or the manufacturer of the engines on the aircraft, Rolls Royce, could confirm or deny the report. Hishammuddin said the government had contacted Boeing and Rolls Royce, the engine manufacturer, and both said the last engine data was received at 1:07 a.m., around 23 minutes before the plane's transponders, which identify it to commercial radar and nearby planes, stopped working. Two sources close to the investigation told Reuters that Boeing and Rolls-Royce did not receive any maintenance data from the jet after the point at which its pilots last made contact. CBS News contacted Rolls Royce twice on Thursday morning at the company's U.K. headquarters. The company refused to comment on the Wall Street Journal report. Aviation experts tell CBS News the engine data would have been transmitted to Malaysia Airlines ground control, and then possibly on to Rolls Royce, by a decades-old system known as ACARS. The simple data transmission system is widely used in commercial aviation, and sends automated messages on virtually every operating system on an aircraft to the ground at regular intervals. According to an article in the New Scientist, published on Tuesday, the Boeing 777-200 that left Kuala Lumpur for Flight 370 sent just two ACARS data transmissions to the ground, one just after takeoff and a second after it reached cruising altitude. The article did not mention any further transmissions. But asked if it were possible that the plane kept flying for several hours, Hishammuddin said: "Of course, we can't rule anything out. This is why we have extended the search. We are expanding our search into the Andaman Sea." The sea, part of the Indian Ocean, is northwest of the Malay Peninsula. He said Malaysia was asking for radar data from India and other neighboring countries to see if they can trace it flying northwest. India plans to imminently deploy airplanes and ships in the southern section of the sea, a senior Indian official said on condition of anonymity because he was not authorized to speak to the media. More than two-thirds of those on board the plane were from China, which has shown impatience with the absence of any results. Chinese Premier Li Keqiang told reporters in Beijing on Thursday that it he would like to see better coordination among countries involved in the search. The passengers' "families and friends are burning with anxiety, the Chinese government and Chinese people are all deeply concerned about their safety," he said at the close of the annual session of the country's legislature. "As long as there is a glimmer of hope we will not stop searching for the plane." He said China had deployed eight ships and was using 10 satellites to search for the plane. Experts say a massive failure knocking out its electrical systems, while unlikely, could explain why its transponders, which identify it to civilian radar systems and other nearby planes, were not working. Another possibility is that the pilot, or a passenger, likely one with some technical knowledge, switched off the transponders in the hope of flying undetected. The jet had enough fuel to reach deep into the Indian Ocean. 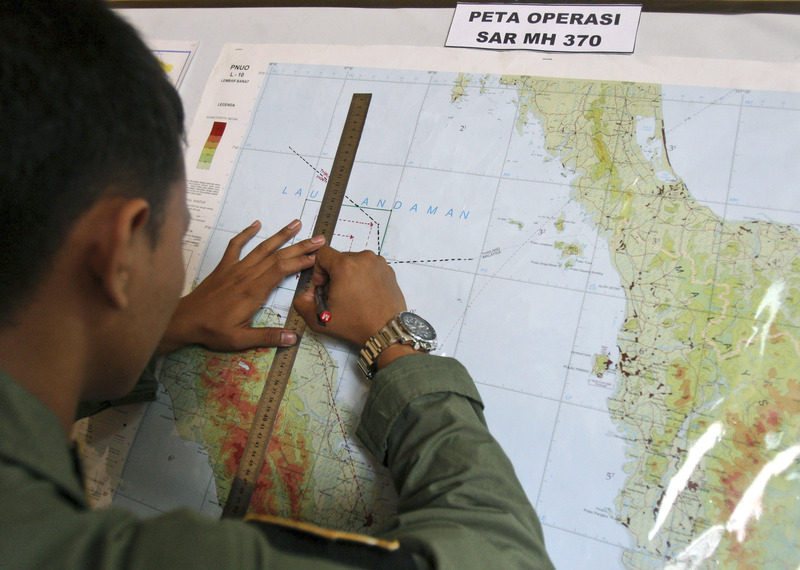 Malaysia's air force chief said Wednesday that an unidentified object appeared on military radar records about 200 miles northwest of Penang, Malaysia, and experts are analyzing the data in an attempt to determine whether the blip is the missing plane. Malaysia has received some criticism for its handling of the search, in part because it took several days to fully explain why it couldn't state for sure whether the plane had turned back. Officials say they are not hiding anything and are searching areas where the plane is most likely to be, while attempting to establish its actual location. "There is no real precedent for a situation like this. The plane just vanished," Hishammuddin said. Experts say that if the plane crashed into the ocean then some debris should be floating on the surface even if most of the jet is submerged. Past experience shows that finding the wreckage can take weeks or even longer, especially if the location of the plane is in doubt. On Wednesday, Malaysian government officials told passengers' relatives that the last words of the captain to air traffic control indicated nothing was wrong. But with no confirmed trace of the jet, the words did nothing to calm waiting friends and families.